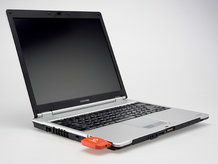 Vodafone, long time provider of 3G connectivity to business laptop users, is likely to be moving into the consumer space with low cost laptops in a similar fashion to competitors such as Orange, which recently offered free Eee PCs with its mobile broadband deal. In an interview with TechRadar, Abi Carrillo, Head of IP Communications & Internet Discovery at Vodafone UK said the company was in talks with some "major laptop manufacturers." "We have got some exciting plans in that space, with some deals around the corner" she confirmed, speaking about future tie-ins with laptop makers. "We need to have the right products for customers, ones that are simple to use. We don't want customers to buy laptops from our stores and find they're not well supported. "After sales support is very important, if a customer has a problem with the laptop they need to know whether they should go to the laptop manufacturer or Vodafone." Carrillo also hinted at losing the 3.5G mobile broadband dongles in the future, in a similar way to new business laptops coming out with in-built SIM cards. "I think consumers find the stick iconic, and it's done a great job," she said. "But it would be even better if [the connection] was inbuilt. "It would be all in there, and customers wouldn't need to carry anything around. "However, I still think the sticks and dongles have got some time left yet."